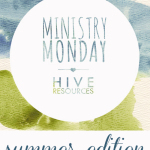 Welcome to Ministry Monday at Hive Resources! 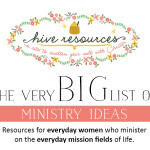 This series is for everyday women serving in the everyday mission fields of life. 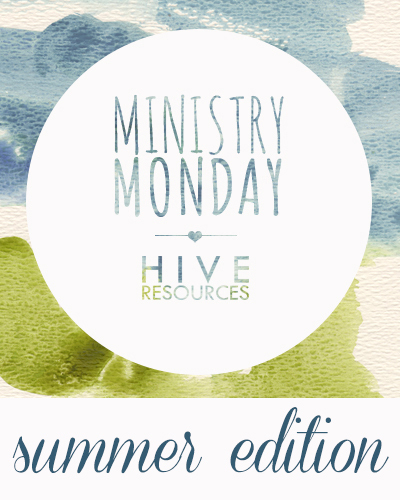 Posts feature resources & ideas for discipleship, outreach events, women’s ministries, Bible study, hospitality, and more. Subscribe today! 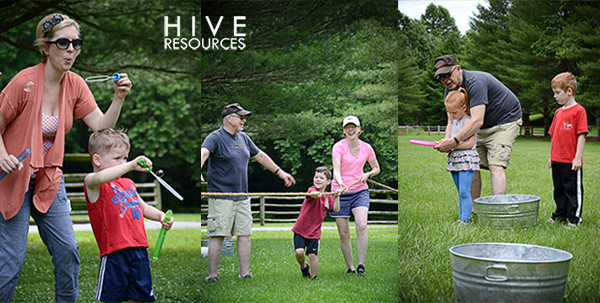 Last week, we packed the kids up and drove 10 hours into the heart of the North Georgia Mountains for summer camp…well, actually Grandaddy Camp hosted by my parents. 1 week. 6 grandkids. About a hundred outdoor activities! 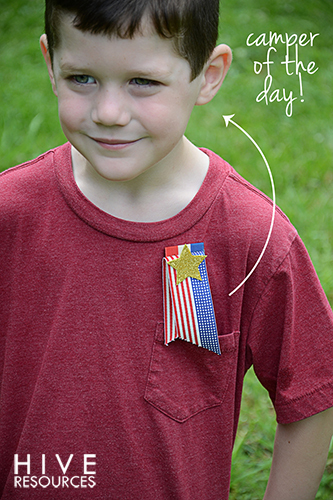 As a mom, I love the idea of Grandaddy or a Grandparents Camp and here’s why. My kids can connect with their grandparents and cousins outside of the holiday fanfare that typically surrounds our visits. 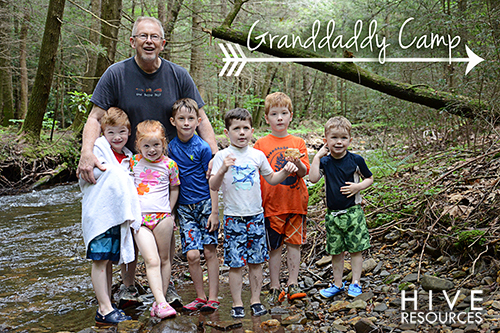 Grandaddy Camp promises a dedicated time each summer for the kids to do nothing but kid-related activities with their cousins and led by their grandparents. 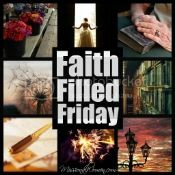 My parents intentionally weave the Gospel into everything they do. So, ultimately, Grandaddy Camp is special opportunity for my kids to see and meet Christ. 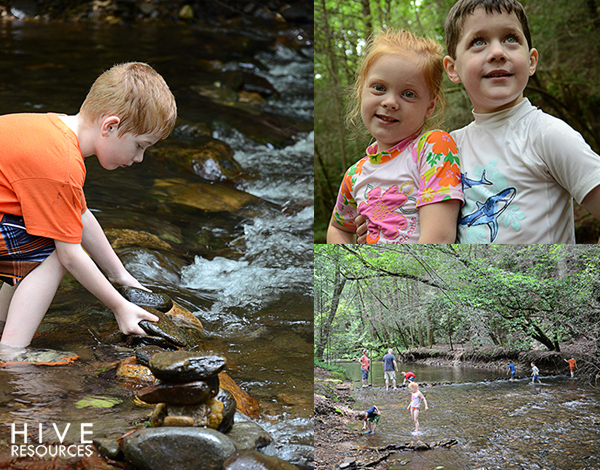 To make the week special, we spent as much time outdoors as we could! And indoor activities were game-related as much as possible. The kids watched very little TV and spent very little time on their game devices. 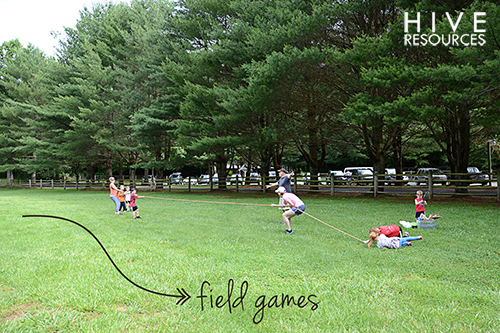 We played field games like tug of war, water guns, tag football, bubbles, and flew kites. 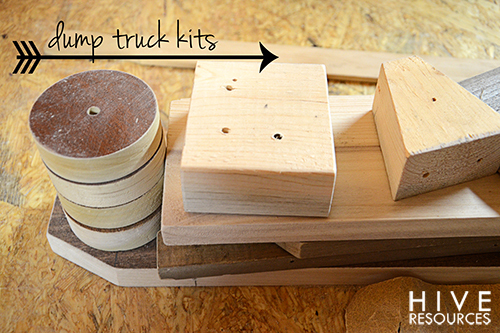 We assembled dump trucks from kits my Dad cut out before our arrival. 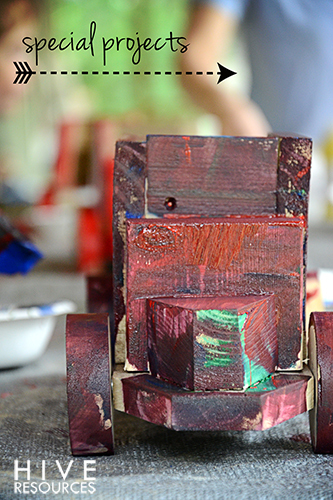 Then, the kids got to sand their truck parts, help (a little) with assembly, & paint them. 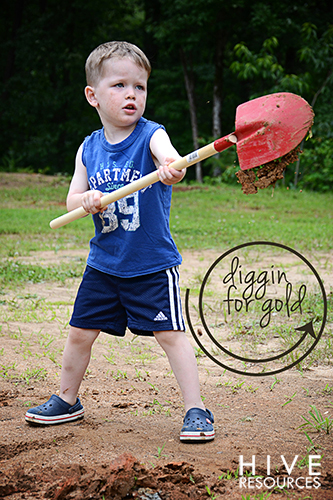 We dug for “gold” (rocks spray-painted gold and hidden) in the yard. And we took a tour of a local gold mine and panned for gold and mined for gems (which was the biggest hit of the week). 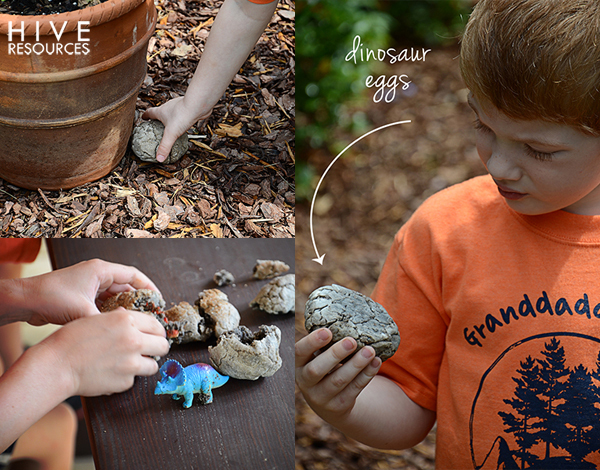 We searched for dinosaur eggs created by my Dad (shhhh!) hidden in my parent’s flower beds. 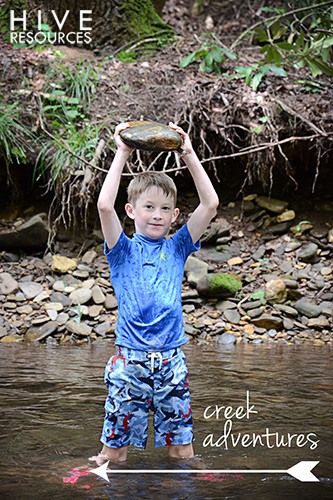 We built a rock dam in a nearby creek, splashed in the water, and appreciated all the bugs and wildlife. In future years, we’ll add fishing to the roster. 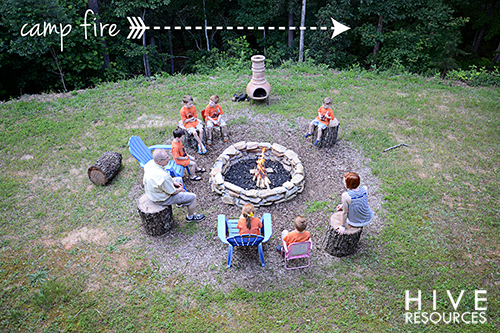 We had a camp fire, rode bikes, and more! We even had a tea party for the one girl cousin! 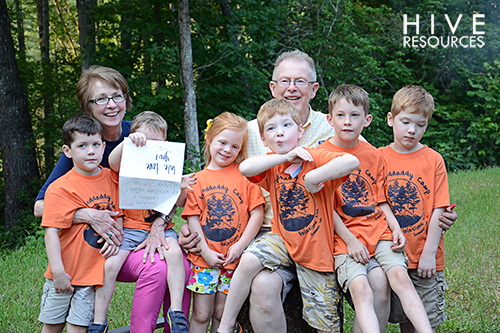 An opening ceremony provides an opportunity for explaining rules and a closing ceremony allows the campers to give their Camp Directors (their grandparents) a thank you card. 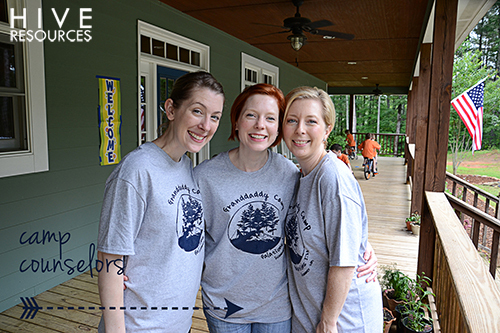 Upon arrival, each camper received a Camp T-shirt. When we took an outing, we tried to wear our shirts! The Camp Directors based the week around a particular fruit of the Spirit – Joy. Next year, we’re focusing on Peace. My Dad led a devotional most mornings. We found they worked best during meals so the kids had something to keep their mouths/hands busy. For meal service, the kids formed a line in the kitchen, picked up a plastic tray and plate of food, and we all ate together outside on my parent’s porch. For group interaction, we instituted a Spirit Stick halfway through the week. Whoever held the stick had permission to talk! And to encourage good behavior, each evening we gave out a Camper of the Day award to a camper who showed compassion to other campers or demonstrated a listening/helpful spirit. Thank you Mom and Dad for hosting us in your home, letting us take over your kitchen, leave indeterminate amount of holes in your yard, and loving us every step of the way! Best..bestest..did i say BESTEST idea EVER..seriously,i can’t get over the ingenuity of it.Kudos to the planning and operations team.Those kids are blessed beyond measures.Grandparents camp will never be an option for us but i might just tone it down and adapt to what will work for us. Yes, Nive! The great thing about this idea is you can organize it as much or little as you like. This is just awesome!! What a blessing for all those kids and how fun! Hope you’ll be sharing more in detail. What a wonderful idea!! You created memories that the kids will always remember! That is so cool! I’m going to pass this idea on to my dad. The only thing is, I’m not an aunt yet, so it would just be my own kids. But, we might have to move farther away from Gpa and Gma soon, so something like this to look forward to would be awesome. Cheri, thanks so much for stopping by! The first year my parents hosted their camp 1 kid! Each year it has grown, but it can be fun regardless of size!